8754 Galambok, Ady E. u. 113. Children/pers. (2-10 Y.) 1.800 HUF/n. Tourism tax/pers. (over 18 years) 250 HUF/n. 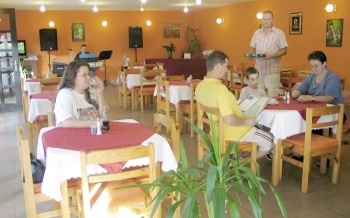 Single bedroom (Breakfast, Thermal bath, Sauna) 15.000 HUF/n. Double bedroom (Breakfast, Thermal bath, Sauna) 20.500 HUF/n. Apartment 2 person(Breakfast, Thermal bath, Sauna) 23.000 HUF/n. Spare bed/pers. (Breakfast, Themal bath, Sauna) 7.000 HUF/n. Tourism tax/pers. (over 18 years) 250 HUF/n. 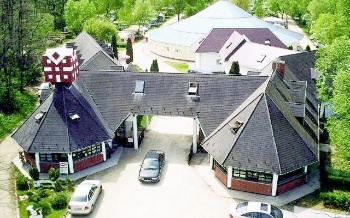 The Castrum thermal spa, camping and guest house can be found in the vicinity of Galambok, 6 km from the motorway M7 in an untouched paradise, at a small brook, surrounded by forests. 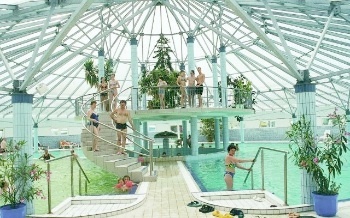 The indoor thermal bath is supplied with thermal water by the four-star-camping from its own thermal springs. In the 36°C water of the small pool some ecperience elements (air-flow massage, bubble bath, etc.) make bathing more pleasant. The water of the large pool is cooled to about. 28°C and it serves as a swimming pool. The shower cabins are equipped with doors and dressing cabins, and there are separate wash cubicles there too. 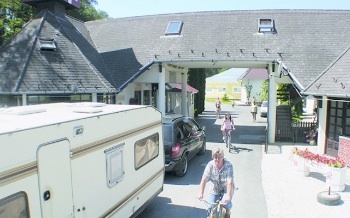 At the entrance of the Thermal Castrum Centre a first class wellness guest-house was built with 13 rooms and 2 apartments with the atmosphere of intimacy. The complete recreation is enabled by some additional services, intimate restaurant, reformkitchen, sauna and massage, WIFI, TV-room. In the 1000 m2 bath, which has a Mediterranean atmosphere and floor heating there is a water surface of 500 m2. The thermal pool with the temperature of 34-36oC and several fun-elements (massage, air blowing, Jacuzzi, etc.) make the bathing pleasant. The temperature of the large pool is ca. 26oC. It is a swimming pool and a splash-pool as well. 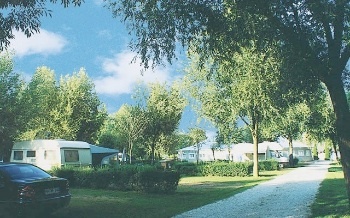 In the recently renewed and up to the ceiling tiled sanitary blocks there is an underfloor heating, that's while the campsite can be opened during the whole year. The shower cabins have a fitting room and a door and you can find one-man washing closets too. In the sanitary blocks there are separate rooms for handicapped persons. In the romantic rooms there are double beds, TV, phone, fridge, shower cabin and WC. The two apartments are fitted with mini kitchen too. The wellness pension is connected to the thermal bath with a heated passage. The perfect recreation is completed by some additional services: restaurant, sauna, massage, fitness room, lounge, darts, boccia, badminton, sandpit, wine-tasting, camp-fire, sightseeing with DOTTO. The unique avifauna of neighbouring Kis-Balaton can be seen at the Kányavári island without permission. You can see the educational path consisting of 15 stations. The Buffalo-reservation gives to the visitors interesting experiences. In the reservation you can buy local foods and craftsman products.